Levies on imports will slow the flow of TVs and medical devices into the United States. They could also thin the already-falling influx of tourists from China. America collects more from them than from all its exports of soybeans, and that number could pass $50 bln by 2022. 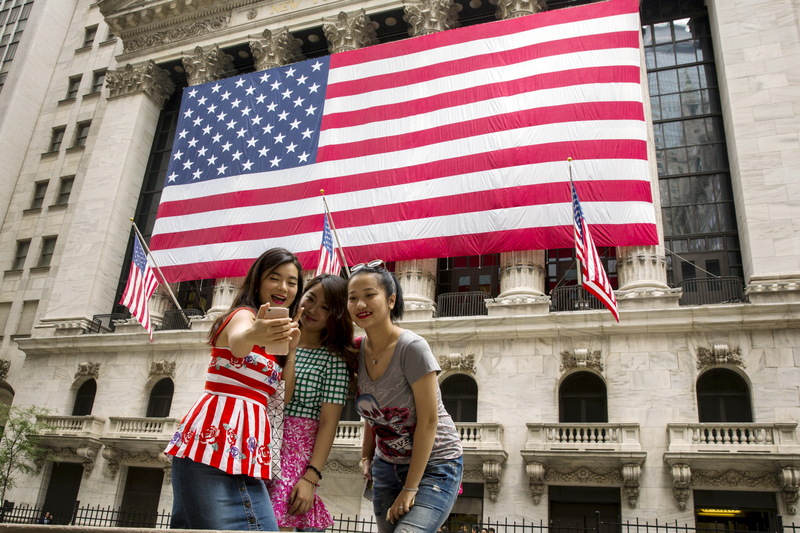 Chinese tourists take photographs of themselves outside of the New York Stock Exchange shortly after the opening bell in New York, July 8, 2015. Chinese state media warned on April 5 that the country would win any trade war with the United States. Both sides have targeted thousands of goods imported from the other for potential tariffs. U.S. President Donald Trump’s administration proposed 25 percent tariffs on some 1,300 Chinese industrial, technology, transport and medical products on April 3. China responded with a list of products that could face similar duties, including soybeans, planes, cars, beef and chemicals. The United States had a goods and services trade deficit with China of $337 billion in 2017, the highest level on record, according to the Bureau of Economic Analysis.